I probably have been kidding myself thinking that the "Extra Virgin Olive Oil" I've been getting at Aldi for less than $4.00 is the real stuff. The following article by Dr. Andrew Weil, my favorite nutrition guru, raises many questions about the quality of the various extra virgin olive oils sold in supermarkets. I've been doing some research lately on the untold olive oil story, which is a scandal in need of widespread exposure and corrective measures. I'll be reporting on what I've learned this week in response to questions that I've been asked on the subject. The highest quality olive oil (the extra-virgin form extracted from fresh olives with gentle pressing) also has a high fraction of antioxidant polyphenols that are very good for you. To qualify as extra-virgin, olive oil must have an acidity of less than one percent. (A few good brands state their acidity on the labels.) In Europe, olive oil must pass rigid taste and chemical tests to be ranked as extra-virgin and must be less than two years old. The age of extra-virgin olive oil is rarely stated on the labels of olive oil sold in the United States. 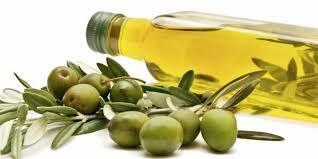 Most of the olive oil sold in the United States is imported from Italy or Spain. While some Italian and Spanish olive oils are of very high quality, many products sold in the United States as "extra-virgin" may be a lesser grade of olive oil and some may be primarily canola or hazelnut oil to which a small amount of olive oil has been added for color and taste. Some olive oil we get here may come from pomace, the olive pulp left after pressing out the oil. Additional oil can be extracted from pomace by treating it with hexane, a chemical solvent - not a good practice. Even when the bottle contains genuine olive oil, it may not be from Italy or Spain as the labels suggest - both countries import huge quantities of cheaper olive oils from Tunisia, Turkey, Morocco or Libya, bottle them and label them "imported from" Italy or Spain. This is deceptive marketing. Given the fact that a lot of the imported olive oil sold in the United States really isn't even olive oil or isn't very high quality, finding one that is what it claims to be can take some work. I've heard reports that some national store brands of imported extra-virgin olive oil bought in bulk and sold at bargain prices are actually substandard oils. I haven't been able to verify this, but I would be skeptical of house brands sold at bargain basement prices. To find out if your olive oil is the real thing, put it in the refrigerator. If it clouds up, it really is olive oil. It will clear up when it returns to room temperature.